Atlantic Bridge, one of Europe’s top performing growth technology funds, has today announced a new €60 million investment fund for early stage companies with global potential that are built from world class research from all Irish third-level institutions and universities. Leveraging the Atlantic Bridge global investment platform and proven ‘Bridge Model’ for scaling technology companies, the Fund will accelerate the commercialisation of ground breaking research generated at Trinity College Dublin (Trinity), University College Dublin (UCD) and all third level research institutions. The Fund, which will provide capital and expertise for scaling companies into the US and Chinese markets and elsewhere, was initiated in a joint leadership collaboration between UCD and Trinity. The €60 million now in place will provide investment and expertise at the commercialisation stage for companies focusing on software, hardware, engineering, physical sciences, life sciences and agri-food. This Fund brings together significant institutional investment from the European Investment Fund – its first cornerstone commitment in an Irish fund of this type having made similar investments in Europe – and Enterprise Ireland, as well AIB and Bank of Ireland, who are already strong supporters of UCD, Trinity and the Irish technology ecosystem. Trinity and UCD have also invested in the Fund. The Fund will enhance success at UCD and Trinity – both ranked in the Top 1% of higher education institutes world-wide – in creating spin-outs and start-ups. The universities are also ranked in the Top 5 of European Universities for producing graduate entrepreneurs. Over the last 10 years they have jointly spun-out over 60 companies, which have secured in excess of €200 million in investment, such as Equinome, Logentries and OxyMem from UCD and Genable, Opsona Therapeutics and Swrve from Trinity. Enterprise Ireland is investing in the Fund from its Seed & Venture Capital Scheme (2013-2018), supporting its key strategic aim of commercialising Irish third level research into globally scalable businesses which will create high quality jobs, stimulate exports and attract international investment. This significant investment represents its continued commitment to increasing the availability of risk capital for SMEs and ensuring there is a vibrant ecosystem of funding available in the Irish market for all startups. 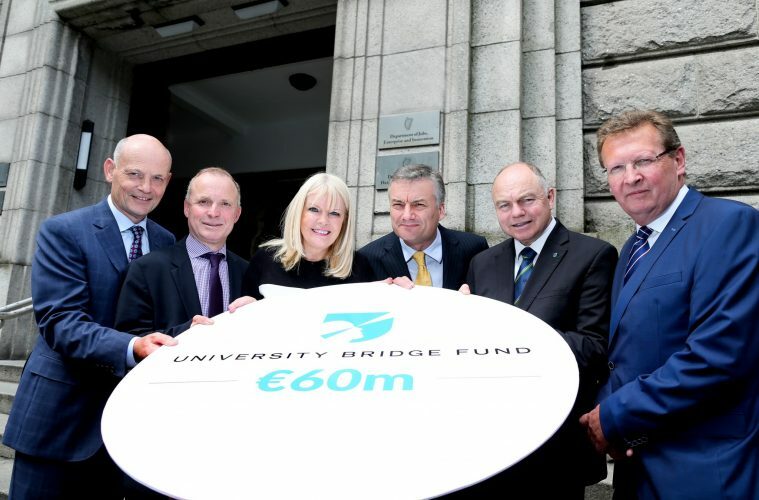 For further information about the University Bridge Fund visit www.universitybridgefund.ie.